Neuroscientist and author Lisa Genova has tackled early-onset Alzheimer’s, left neglect caused by traumatic brain injury, and autism in her best-selling novels, and now she takes on Huntington’s Disease in her latest novel, Inside the O’Briens. 44-year-old Boston police officer Joe O’Brien has been suffering from some unusual symptoms — he loses his grip on items he’s holding, occasionally trips over nothing, and has sudden outbursts of temper out of proportion to the situation. He attributes most of this to getting older, but agrees to see a doctor at his wife, Rosie’s, urging, after a buddy on the force tells her about Joe’s odd behavior at a police training event. Joe and Rosie are shocked to learn that Joe has Huntington’s, a disease they’ve never heard of, and dismayed to learn that each of their 4 grown children has a 50% chance of having inherited the HD gene. As Joe’s symptoms steadily worsen, he worries about how it will affect his job, enlisting his buddy to be his mirror and let him know when the time to leave the PD comes. Not only does HD cause uncontrollable movement, Joe often doesn’t know his body is moving until he notices people staring or his fidgeting results in someone or something being struck. Joe’s children have to deal with the knowledge that not only will their father die from HD, but they may have it too. Each of them has their own reasons to worry – JJ is a firefighter and he and his wife want to start a family. Megan is a dancer with the Boston ballet, and Katie is a yoga instructor. Patrick is a bit adrift, with no direction in life, staying out all night and going through a string of girls. He’s the least fleshed-out character, at times appearing to exist only to cause tension in the family. Joe’s story alternates with Katie’s. The youngest of the 4 kids, she’s always looked up to Megan, whom she shares one of the apartments in the tri-level O’Brien house, but feels a distance between them. She also feels a bit neglected by the rest of her family, who’ve never shown an interest in her yoga practice. She is keeping her relationship with her boyfriend a secret, fearing they won’t approve of his background, and struggles the most with the decision to get tested for the HD gene. The O’Briens are a close-knit typical Irish Catholic Boston family. The siblings gently tease each other, mostly with affection but not always. Rosie is church-going and has a holy water font by her front door, but her kids have strayed from the church, and Rosie deals with her own crisis of faith as she watches her family crumble under the stress of both Joe’s diagnosis and their own struggles to decide whether or not to get tested. The research put in by the author is clear throughout the story, and confirmed in the author’s note that follows the story’s conclusion. Genova spent hours with members of the Boston Police Department, took the 200 hour class to be a certified yoga instructor, and grew close with both HD patients and loved ones of those with HD. 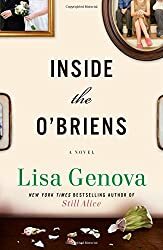 While Still Alice is still my favorite of Genova’s novels, Inside the O’Briens is a close second and I am adding to our list of 5 Star Reads.